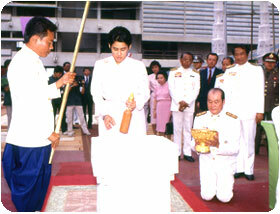 Sukhothai Thammathirat Open University (STOU) was officially established by Royal Charter on 5 September 1978 as Thailand’s eleventh state university. His Majesty King Bhumibol Adulyadej (King Rama IX) graciously bestowed the university its name in honor of King Prajadhipok (King Rama VII), who once held the title “Prince Sukhothai Thammaracha” prior his accession to the throne. On 24 October 1978, His Majesty issued royal mandates appointing the first University Council and appointing Professor Dr. Wichit Srisa-an as the first president, effective from January 1978. After approximately two years of preparation, STOU received its first academic class on 1 December 1980. STOU began with three schools of study: Educational Studies, Liberal Arts and Management Science. From 1979 to 1984, STOU had no home campus of its own, so it had to share space with such agencies as the National Education Commission, Thai Airways, the Faculty of Economics of Chulalongkorn University, and the Ministry of University Affairs. 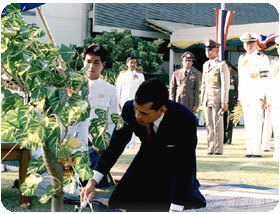 In 1981, Mr. Monkol Kanjanapas donated to the university a 30-rai section of land located in Pakkret district of Nonthaburi province. The university then bought more land, bringing the total to approximately 135 rai. Construction at this site began in 1982, and the university began operating from the new location on 9 December 1984. At its founding, STOU was the first university in Southeast Asia to use the distance learning system. This new system of learning expanded the role of higher education in Thailand by engaging learners who previously had no opportunity to further their education. Since its establishment, STOU has enabled the development of individuals and communities throughout Thailand and beyond.